What Do Girls Expect on the Second Date? What Do You Do if Your Parent Won't Let You Have a Boyfriend? Show respect for your date as a person. Dating someone who has never dated before is not much different than dating someone who has. Making a good impression, treating the person with respect and being polite are key ingredients for any potential relationship. For someone who has never dated, however, each step in a relationship can seem huge and sometimes scary. Patience and understanding are the keys to success. If you feel strongly attracted to someone, it is easy to come on too strong and scare that person away. 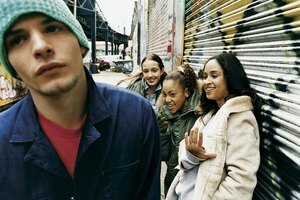 Yet intense crushes are common during the teen years, notes Carl Pickhardt, a psychologist, in the article, “Adolescence and the Teenage Crush,” on Psychology Today's website. Before approaching someone who is practically a stranger, slow down and remind yourself that what you are feeling is infatuation. Take a deep breath and an emotional step back in order to treat your crush as a person rather than the object of your deep desires. Friendship is the basis of any good relationship, according to the WebMD.com article, "How Do I Get a Girlfriend?" Rather than asking your crush out right away, consider getting to know her first. Becoming comfortable with each other at the beginning can take a lot of pressure off of the actual date. Listen when he talks. Ask questions about his day and remember the things that are shared. Ask follow-up questions the next time you talk. Show your crush that you are trustworthy and she will gradually feel more comfortable. Once you progress to an actual date, keep in mind that everything is new for the other person. Rather than rushing things, give her time to enjoy each step. Someone without dating experience might get a thrill of excitement about something as simple as entering a restaurant together. Try to see the date through your crush’s eyes, and encourage him to talk about how he feels. Most parents set dating rules for their teenagers, and those rules might be even stricter for someone who is just beginning to date. Make an effort to get to know your date’s family and reassure them that you will look out for their child. Ask about curfew times, off-limits areas of town and other important details. Keep both sets of parents informed, recommends the article, "Dating Guidelines for Teens," on the FirstThings.org website. Let them know where you are going and when to expect you back. Call if you will be late. Pay close attention to any rules or boundaries that your date sets. Never pressure someone about intimacy, drinking or other activities. Show respect for your date as a person and show him or her that dating is fun rather than frightening. WebMD.com: How Do I Get a Girlfriend? Fritscher, Lisa. "How to Date Someone Who Has Never Dated Before." Synonym, https://classroom.synonym.com/date-someone-never-dated-before-21618.html. Accessed 22 April 2019.